Handcrafted chainmaille jewelry. Love in Every Link! Half byzantine with hoop. Hoop earrings. Mother's Day. Bridesmaid gift. Hearts and flowers chainmaile bracelet, Mother's Day, Bridesmaid gift, gift for her. Announcement Chainmaille. The stuff of knights and legends. King Arthur & dragons. Lord of the Rings & Game of Thrones.For centuries, men would wear mesh garments (woven of steel rings) with their armor to protect themselves in battle. Today we weave these rings into wearable art. A little history, a little bling. Love in every link! Chainmaille. The stuff of knights and legends. King Arthur & dragons. Lord of the Rings & Game of Thrones.For centuries, men would wear mesh garments (woven of steel rings) with their armor to protect themselves in battle. Today we weave these rings into wearable art. A little history, a little bling. Love in every link! Mini mobius earrings, aka Maillestrom, Handcrafted, chainmaille earrings, petite and unique. Gift for her. Christmas ball ornament. 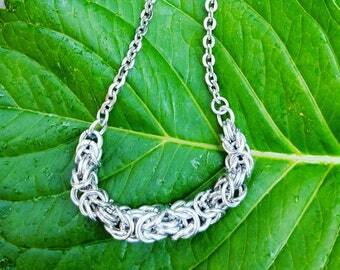 Handcrafted chainmaille style. Unique unusual Christmas ornament. Stocking stuffer. Secret Santa. Christmas tree ornament Chainmaille pattern. Unique ornament. Secret Santa. Stocking Stuffer. Acetate tear drop, hoop, dangles, with lapis beads and chainmaille detail. Earrings. Feather light! Colorful scale earrings with chainmaille, Byzantine pattern with scale. Customize. Light and fun. Love this and it came quick! thank you! These came today & are just as cute as can be! I absoluely love them! Thank you! One of my favorite thing about creating is meeting new customers and talking about what I do at craft shows. Handcrafted. Literally every single ring woven into these pieces crosses over my pliers. Love in Every Link. Handcrafted chainmaille jewelry and more! I got hooked making chainmaille jewelry once I mastered the Byzantine weave. After that it was hard to get the pliers out of my hand and the rest is history! Speaking of history. These weaves are ancient! Modern day applications in jewelry can not take away the fact that these patterns are OLD...I mean like 14th century old. I hope you enjoy looking around the shop as much as I enjoyed making everything you see! Maker of the things. Love in Every Link! Find Shinyhappydangles at the following upcoming markets! Art in the Garden. Annual gathering of local handcrafters/artists in a lovely setting with live music and a sweet cafe on site. You love Asbury Fresh? You'll love Pier Village Fresh in Long Branch. Local goodness in the form of food and art and crafts and music. Sunday Fun Day= Market Day. Every Sunday from 10 till 3 in Kennedy Park come hang out with your local market vendors. Artists, food, flowers, live music. Support Local. Support handcrafted. 37th annual outdoor craft show near the beach featuring all hand crafted items only from all over the tri-state area. Surrounded by quaint Victorian/Queen Anne bed and breakfasts. Rain or shine. On September 21, 2019, The MakeShift Union is hosting the 5th Annual Makers Festival at Manahawkin Lake Park in Manahawkin NJ. The mission of our festival is to highlight the underground current of Makers who are changing the landscape of production & consumerism in America, and more specifically, Ocean County where we live, work & play. It will be a day to celebrate the collective artistic endeavors of homegrown talent locally & beyond, and will feature over ten dozen Makers whose crafts include everything from handmade & vintage fashion, sculpting & woodworking, photography & fine art, craft beer, food and music. Welcome to Shinyhappydangles!!! (I was humming Shiny Happy People by REM while making earrings one day)... Creating beautiful things makes me happy. I hope you find something you like in the shop. I look forward to hearing from you. Your satisfaction is my highest priority. If you are not completely satisfied with your purchase, please let me know right away and I will do my best to resolve the issue quickly. I will refund your money up to 14 days after purchase or extend credit, whichever you request, minus the shipping cost. Credit cards and paypal welcome. Most orders will ship within 1-2 business days (unless it is a special order) USPS Ground shipping. If you need it fast, no worries, we will just to adjust the shipping accordingly. No international orders at this time. Custom orders are a fun way to take a product you see and like and make it your own. Colored jump rings can make pretty much any design a little more amazing.